SmartPen 2 is one of the most complete connected pens, and sold on the market. Delivered with its station of reception to reload your pen and tidy up the receiver. It possesses a diode to indicate you its level of battery. In spite of its triangular shape, it has a very good ergonomics and does not slide during its handling. Equil proposes 2 applications for the use of its pen: one for the creation, the other one for the grip of note. The purpose of this object is to retranscribe your notes or your drawings on the mobile application. Another feature is the possibility of streamer your notes up to 20 people at the same time. And also discover the test made by the editorial staff on our website. Available for iOS and Android, at the 185€ price(prize). Tidy up your case of coloured pencils, keep just Scribble, with its wide color palette he will know how to fill your expectations. Indeed, it is possible to collect colors everywhere around you as with this orange, what really allows you draw/to colour with ONE OR SEVERAL colors which you have in mind. How it works? The pen collects, thanks to a sensor, the color of your choice. He can memorize up to 100,000 colors and take 16 million tints. Are more afraid of knowing if you have in your case the color which you wish. Scribble is not still available on the market, but he will soon bring out 2 versions of it: a version stylet for$79,95 (60€) and a version fountain pen for$149,95 (110€). THE iSkechnote consists of a tablet, a “Slate”, and of 2 pens, “iSkins”. 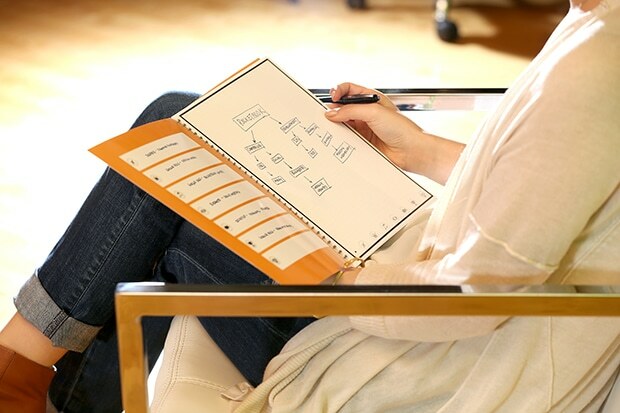 The principle is simple, you put any type of paper on the tablet who is connected with your iPad, the pen as for him will take care with scanning your notes thanks to a magnetized ring. Sketches and notes are automatically transferred to your iPad and you can always bring to it modifications afterward, since the application iSkechnote. 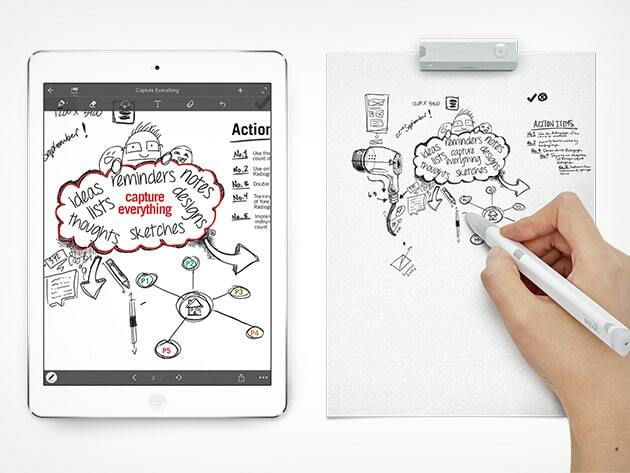 The tablet can store all the same your papers and your scrawls thanks to its internal memory. Available only in pre-order for the moment, at the 179€ price. Rocketbook. Under this explosive name, hides a revolutionary exercise book. If you are as me, ceaselessly to think of things but if you are afraid of forgetting them, this exercise book is made for you. You would take a piece of paper which drags? It’s true, but a paper, it also gets lost! The advantage of this exercise book and that will transfer all that you can write and draw on platforms of on-line storage, such as Dropbox or Evernote. Other positive point, and what makes its peculiarity, is that when you managed to fill its 1000 pages, you can cross it in the microphone wave and everything will fade as if by magic. However, this function works only with a pen in particular: Pilot FriXion, which will be supplied with an exercise book. You will have the choice between 2 exercise books: The Standard Edition and Executive Edition. The only differences being it dimensions and the number of pages. Delivered for July, 2015 for 24€. A pack containing an exercise book and 3 pens is available as for him for 33€. This project which met a big hit during its campaign of crowdfunding is an innovative idea for the education and the awakening of your children. The objective being ” to transform a passive passion into creation activate “. If you are a member of those who think that too many children nowadays abandoned the good old pencils for screens and video games, this exercise book is going to become your best ally. All which you need is of coloured pencils, a tablet or a Smartphone. The principle is very simple and within the reach of the quite small: the child colours in his exercise book according to his desires and when he finished, he can then photograph his drawing to give to him life in the application. It gives them the real motivation to put a lot into their drawing. Playful, the contribution of the digital technology is not put advanced, but is a tool allowing to make their drawings live. Available in your usual bookshop or on sites specialized for 12.90€. Then opinion to the artists and to the amateur draftsmen: you have no more excuse.